Pickling is a process which consists of chemical removal of scale (surface oxides) and other dirt from steel by immersion in aqueous acid solution. During the pickling process, acid reacts with scale as well as base steel to produce dissolved metal salts. The pickling process generates a considerable quantity of spent pickle liquor (SPL) containing the dissolved salts as well as residual free acid. This SPL is either to be disposed of after chemical neutralization with alkali or regenerated. Carbon steel is usually pickled either by sulphuric acid (H2SO4) or hydrochloric acid (HCl). But hydrochloric acid is now preferred over sulphuric acid due to the following advantages. It consistently produces a uniform light gray surface on high carbon steel. Probability of over pickling is much less. Iron concentrations can be as high as 13 %. Rinsing is facilitated because of high solubility of iron chloride. It is safer to handle when compared with sulphuric acid. Hydrochloric acid regeneration refers to process for the reclamation of bound and unbound HCl from metal chloride solutions such as ferrous chloride. Regenerated acid has no adverse effect on metal cleaning efficiency compared to virgin acid. It pickles as efficiently as virgin acid. There are several processes for the regeneration of spent hydrochloric pickle liquor. A number of different process routes are available. The most widely used is based on pyrohydrolysis, hydro thermal and adiabatic absorption of hydrogen chloride in water, a process invented in the 1960s. Distillation process has been used where there is a significant level of free acid is remaining in the SPL. Purified HCl, at the azeotropic concentration of about 15 % w/w is recovered from the ‘overs’ while the concentrated ferrous chloride liquor is recovered from the ‘bottoms’. This process only recovers the ‘free acid’ values. In one variation of this process, the ferric chloride accumulating in the bottom is crystallized out. In another variation, the acid retardation ion exchange process is used to reduce the acidity of the liquid ferrous chloride by product. In this process sulphuric acid is added to SPL. This causes the following reaction to take place. The liberated HCl is recovered along with the original free HCl by distillation, while the iron is crystallized out as ferrous sulphate monohydrate. Pickliq hydrochloric acid regeneration (PHAR) is a process for regeneration of spent hydrochloric acid from steel pickling. The process is applicable to any size pickling operation. In this process SPL typically exits from the pickling line at around 11 % to 13 % iron and 2 % to 4 % free hydrochloric acid. The temperature of the acid is approximately 80-90 deg C for a continuous pickle line but may be less for a batch pickling operation. Using a cross flow heat exchanger, the exiting SPL exchanges heat with the Regenerated Pickle Liquor (RPL) returning to the pickling line. The spent acid to be regenerated then flows into a reactor where it is contacted with concentrated sulphuric acid (93 %). The sulphuric acid reacts with the ferrous chloride thereby liberating free hydrochloric acid in solution. The final temperature reduction is accompanied by chilling the reaction mix to temperatures of -15 to -1 deg C in a crystallizer tank. The temperature reduction reduces the solubility of ferrous sulphate, causing it to precipitate out of solution. The resulting iron sulphate is separated by crystallization. The mother liquor, now fortified with hydrochloric acid, but containing a residual of sulphuric acid is then separated from the crystals by vacuum filtration or centrifugation and recycled to the pickling process. A small amount of water is used to wash the residual mother liquor from the crystals. This water compensates for the water of hydration that is combined with the ferrous sulphate. The level of residual sulphuric acid in the regenerated HCl is dependent on the concentration of iron and the temperature. The process operates at low temperatures and produces ferrous sulphate heptahydrate (FeSO4.7H2O). 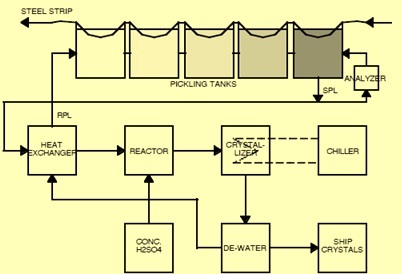 Typical layout of PHAR process is at Fig 1. The spray roaster process is a pyrohydrolytic process in which the spent acid is spray atomized into a directly fired furnace and (by contact with oxygen) and splitted into Fe2O3 powder (solid phase) and HCl (gas phase). Reaction temperatures are in a range of 400 to 700 deg C. The gaseous HCl is absorbed in water to form regenerated hydrochloric acid of about 18 % strength which can be reused for pickling. It is common and attractive to use the slightly acidic rinse water from the pickling line as absorption liquid. The three basic process steps of this process are preconcentration, roasting and absorption. In the preconcentration phase, the incoming waste acid undergoes direct heat and mass exchange with the hot exhaust gas from the roaster furnace. The direct heat exchange is accomplished in a venturi evaporator where the waste acid is atomized and turbulently intermixed with the roast gas at high velocity. The waste gas is thus partially evaporated, leaving behind a preconcentrated waste acid to be used as liquid feed to the spray roasting furnace. The spray roasted iron oxide powder has high oxide purity and a good surface structure. Due to these properties it is a valuable input material for the downstream industries. Typical flow sheet of a spray roasting process is given in Fig 2. The fluidized bed process is also a pyrohydrolytic process like the spray roaster process and it takes place in a directly heated furnace. In this process the conversion of waste acid into iron oxide and hydrogen chloride takes place in a fluidized bed at a temperature of about 850 deg C. Due to it the iron oxide obtained from a fluidized bed hydrochloric acid regeneration plant is of a granular, sintered consistency and is called pellet. Average diameter of pellet is 0.8 mm to 3 mm depending on the reactor set up. The pellets are iron ore substitute and can be recycled back within the integrated steel plant. In the fluidized bed process, absorption of HCl is done in similar way as in spray roasting, but obtainable acid concentration is slightly lower typically at 17 %. An important advantage of fluidized bed process over spray roasting process is the lesser NOx content of the stack emission gases since it operates at lower temperatures. When the main purpose in the operation of a pyrohydrolysis plant is the production of high quality iron oxide powder, then a reactor design that combines the energy efficiency of a spray roasting furnace with the homogeneous and stable process conditions of a fluidized bed process is adopted. This needs higher investments in the dedusting and gas quenching technologies. Hydrothermal regeneration process is relatively newer technology. It replaces the directly fired furnace and gas/liquid absorption by an alternative process route consisting of oxidation and hydrolysis. Formation of Fe2O3 takes place in liquid phase which reduces the consumption of heat energy. The concentration of regenerated acid is equal to waste acid total HCl concentration .This concentration of regenerated acid can be increased to a level higher than 30 % by using a preconcentrator. The iron oxide quality produced by this process is comparable to pyrohyrolytic processes in terms of Chloride ion contamination. However specific surface of particles is adjustable to much higher figures by tuning of the hydolysis conditions.